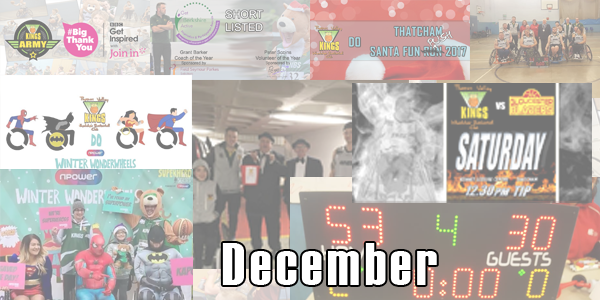 Every day until New Years Day (except Christmas Day) we will be running our review of the year month by month, Join us for a look back at an action packed 2017! 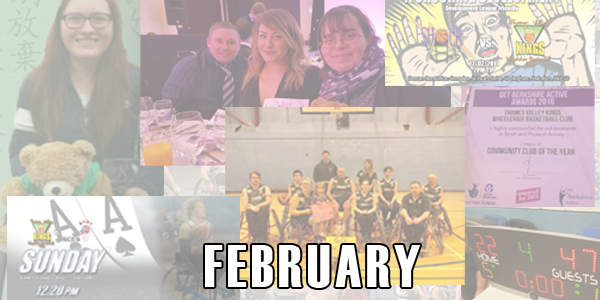 We Kicked of 2017 in style with a nomination for Get Berkshire Active's Club of the Year which was opened for a public vote, before the first weekend of the year saw Kings Division three team pick up a huge away win against Hampshire Harriers 2 45-16. 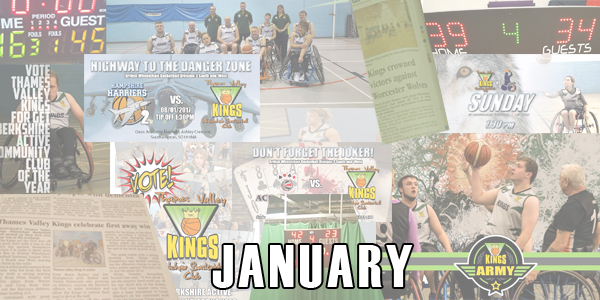 The Kings were then proud to announce the formation of our #KingsArmy before we faced Worcester Wolves at home where Kings fought to a huge 39-34 win, The winning run didn't last forever however as the final game of the month saw Kings go down 23-42 against Aces. February saw Club founder Jacqueline pick up her Lifetime achievement award from Get Berkshire Active and the club itself missing out of community club of the year! News of Kings Alumni Kayla Bell who was selected to represent Great Britain Women at the 2017 OsakaCup in Japan brought a smile to our faces - The month also saw a friendly for our Division Four team against Swindon Shock which Kings won 29-16. Kings Division Three team, however, saw a home defeat against Aces 22-47. Plus our awesome fundraiser Michelle from People Essentials turned the heat up on her fundraising campaign for the Paris Marathon. 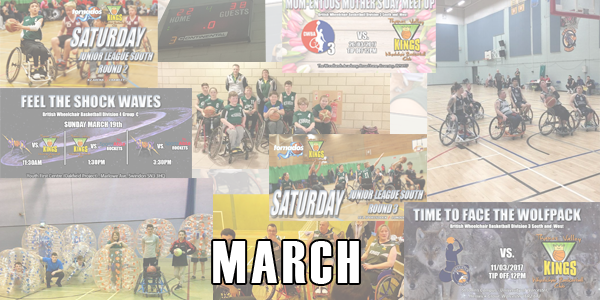 March saw "Medicine Man" Joe Seward organising a Zorb football fundraiser event, Kings founder Jacqueline was announced as a semi-finalist for a Thames Valley Venus Women Awards, The Division Three side saw a return fixture against Worcester Wolves which ended in a Wolves victory and a huge win against CWBA 3 on Mother's day, The division four team saw their season start with two huge wins plus another two huge rounds of Junior League seeing both the Under 15s and 19s reach national finals! 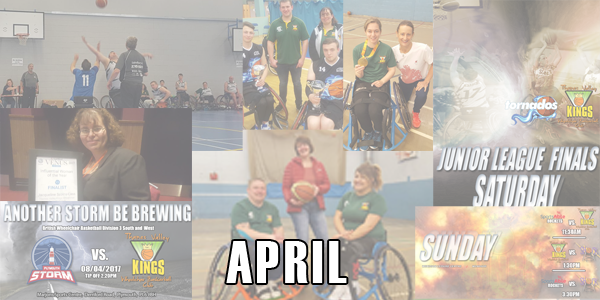 We kicked off April as we hit the pages of Out and About Magazine which came free in copies of the Newbury Weekly News with a huge 4 page spread. Our fundraiser awesome Michelle from People Essentials also hit the headlines for the Paris Marathon campaign. Kings founder Jacqueline was announced as a finalist for a Thames Valley Venus Women Awards. On Court Kings Division 3 faced Plymouth Storm in Plymouth which saw Storm pick up the win 37-60. In Division 4, the second round of matches ended in 2 defeats and the Juniors went to finals with the Under 15s finishing 8th and the Under 19s finishing runners-up. 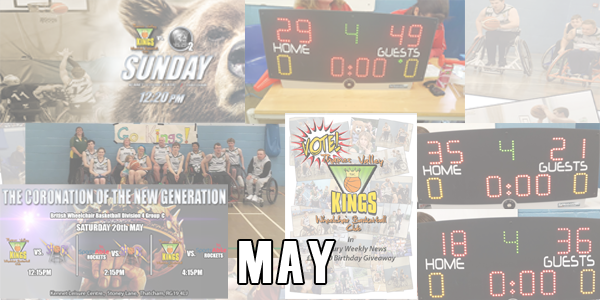 May saw the final games for the Kings for the Division Three of the 16/17 Season against Warwickshire Bears which ended with Bears winning 29-49 to complete their perfect season.The Division Four completed their season with a mix bag of results defeat against Swindon Shock 18-36 and a win against Sportable Rockets 35-21. Kings also made the shortlist for the Newbury Weekly News 150th birthday give away. Fundraiser Michelle Bailey who completed the Schneider Electric Marathon de Paris back in April finished fundraising and raised a whopping £1100! 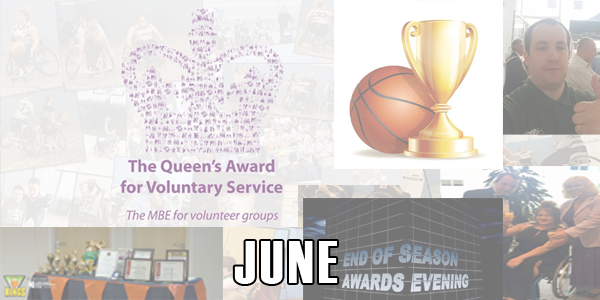 June was action packed and started with a bang on the 2nd when it was Announced We have been honoured with the Queen’s Award for Voluntary Service, highest award a voluntary group can receive in the UK - the first club in the UK to get the award! That was followed by Buzz Connect "The Big Pitch" and members of the Club attended the Venus Awards Finals as club founder Jacqueline was up for Influential woman of the year and our end of season awards do as Some huge awards were up for grabs, Including Division 3 and Division 4 Player's Player award, which we hear the voting for was incredibly close for both awards this year. July saw Kings members enter the Newbury Carnival dressed, well as, Kings! 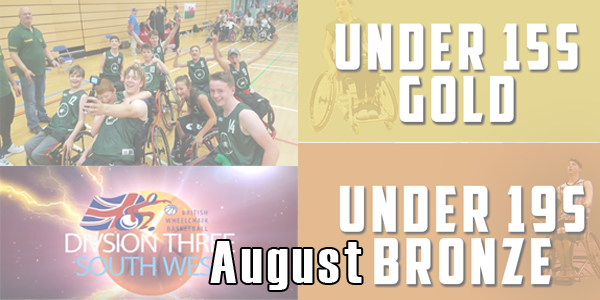 July also saw British Wheelchair Basketball's Club Conference which at the AGM saw Jacqueline was voted on to the board for the national governing body and The Richard Longhorn Trust National Wheelchair Basketball Awards saw Joe Seward win Junior Volunteer of the Year. 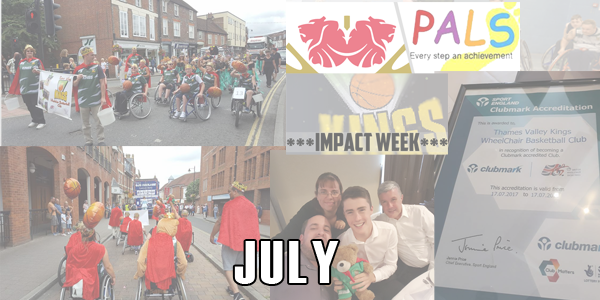 Kings also celebrated the work of their awesome volunteers - With Impact Week, a first-hand look at the incredible work they do in raising the profile of wheelchair basketball. August and the height of summer saw Kings Juniors join the South East Region for Regional Junior Championships which led to medals for both the Under 15s and 19s, with Gold for the U15s and Bronze for the U19s. We also found the teams we would facing for the 2017/18 season and presented it to the world in our flash video. 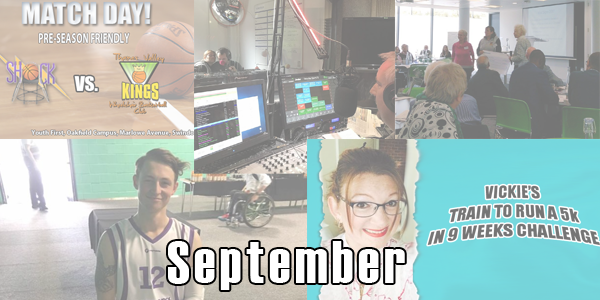 September kicked off with School Games which saw Kings Reece Barker along those selected to represent England South who just must out on the Bronze against Scotland, Fundraiser and Kings Table Official Vickie Thomas started her 9 weeks to 5K challenge. A pre-season friendly against Swindon Shock and a Kennet Radio Interview on Saturday Sport. The Kings also attended Berkshire Community Foundation Charity symposium with Jacqueline also collecting a cheque for £1000. We are thankful to The foundation who have really helped the club over the years. 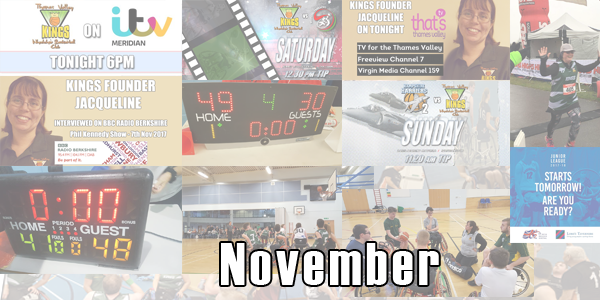 October saw the tip-off of the 2017/18 season, we wished everyone the best of luck! In our first game against Swansea Storm we saw defeat 28-51. 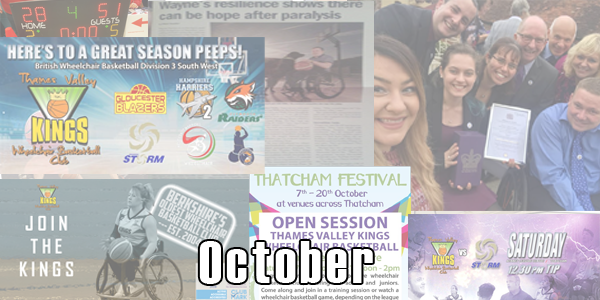 We kicked off our recruitment campaign, Had some open sessions for Thatcham Festival, Club captain Wayne hit the headlines and we also collected our Queen's award for Voluntary Service at a ceremony with the Lord Lieutenant of Berkshire. We hit the TV twice on Itv median and thats tv Thames Valley and a radio interview on BBC Berkshire. Vicki completed her 5k fundraising challenge in style. The Division Three team picked up two wins against West Coast Warriors and Hampshire Hornets 2 and We started our junior league campaign in Littlehampton with 1 win and 1 defeat.